There are few images of 20th century architecture more iconic than the nighttime view of Case Study House #22 set on its eagle&apos;s-nest site high above the lights of Los Angeles. With his two innovative houses for the famous project of the Arts and Architecture magazine, American architect Pierre Koenig (1925-2004) became one of the leading figures of the Modern movement in America. While still a student of architecture, he designed and built his first exposed steel house in 1950, proving that the use of prefabricated materials could allow for spatial freedom in affordable houses. 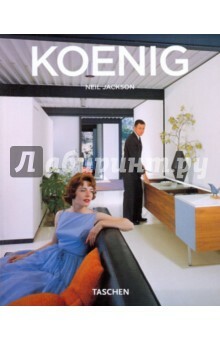 Koenig&apos;s houses, like the Johnson House (1962) or the Oberman House (1962), are a direct response to Southern California&apos;s extremely warm and dry climate. His work is deeply marked by his commitment to environmentally and socially responsible design. His houses have thus become characteristic of the spirit of a whole generation: they perfectly capture the excitement and optimism of the American postwar society. Издание на английском языке. замечательное и хорошо иллюстрированное издание.